At UC Santa Cruz, anyone who passes the Koi Pond will walk by the Mary Porter Sesnon Art Gallery, but the significance behind its namesake may be less apparent. 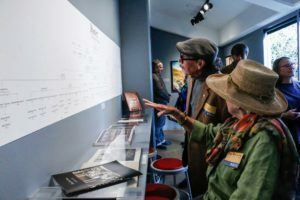 Three exhibits, which opened on April 12, honor the common theme of recognizing influential locals who have passed, such as Mary Porter Sesnon, whose family financed many artists in the Bay Area and Santa Cruz poet Kathleen Flowers. In the main art gallery directly above the Porter Study Center, the “Mary Porter Sesnon and Pino Alto” exhibit tells the story behind the gallery’s calligraphic, poetic and art-collecting namesake. The Mary Porter Sesnon Art Gallery was named such after a gift from Sesnon’s daughter, Barbara Sesnon Carton. Downstairs, “for the breath of a poem” reanimates Sesnon’s practice of writing calligraphic renditions of poems in the present day. Artist Diane Jacobs gives an homage to her late friend Flowers by making artistic renditions of her poetry. These exhibits and Molly Cliff Hilt’s “State of Wonder,” just around the corner from the main Mary Porter Sesnon Art Gallery, will run until May 12. The Sesnon family passes down an old leather-bound scrapbook from generation to generation. Its unassuming cover hides a trove of oil paintings, sketches and poems rendered in calligraphy by Mary Porter Sesnon. 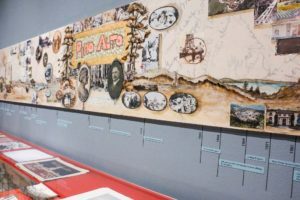 The art in the exhibit, while not drawn or painted by Sesnon, is a collection of work from artists featured in her historical scrapbook, or salon book. It records the Sesnon family’s many lavish salons and was compiled by Sesnon between 1911 and 1927. The idea began when curator and director Shelby Graham started looking through the salon book, which documented various lavish artistic gatherings the Sesnon family had at their house in Aptos, where they invited artists such as Will Sparks. Sesnon’s great-granddaughter Molly Cliff Hilts contributed her own charcoal rendition of her great-grandmother, which hangs by the door of the gallery. Sesnon’s elaborately wrought hair and clothes frame her stoic, far-off expression as she gazes into the distance. “It really made sense to tell the story of who she was, because that happens a lot of times that there’s a name somewhere and then years go by and the story gets lost,” said Hilts, who has her own separate exhibit around the corner from the main gallery. Graham centered the gallery around a stage with two ornate wood-carved chairs. On one side of the stage she placed artists featured in Sesnon’s salon book, recreating the feel of the Sesnon’s parlor. One of these artists is Will Sparks, an early nineteenth century Bay Area artist who painted and sketched adobe buildings and missions. Sparks included one of his etches in Sesnon’s salon book in 1911, and Graham found two of Sparks’ other oil paintings of architecture to include in the gallery. Sparks was a member of the Bohemian Club, an all-male society that discussed art and poetry of the day and received support from the Sesnon family. Today, it is controversial as it remains composed of only male government officials and businessmen. Downstairs forging a poetic tie between the Sesnon family’s salons and the present is an installation by Diane Jacobs in which the late bilingual kindergarten teacher and Santa Cruz poet Kathleen Flowers’ poems are written on the walls. Light dances through the cut-out letters of the poem Before Surgery, the black paper stuck to the window so the words are illuminated from behind. “I like to think the spirit is freed/ once the body dies, but it is this body/ that allows such beauty, such exquisite/ pain. I unzip my jacket, offer this malignancy/ to the dark gulls, to the night,” the poem reads through tiny slits of light from the cut-out letters flickering on the viewers’ skin. 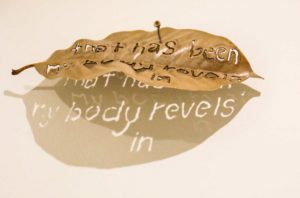 The artist plays with light in nearly every piece, so viewers often read shadows or light filtering through cut-outs rather than words written directly on a page. “There’s something about shadow that has more mystery and it’s less about the object but more about the reflection or how that element of light creating the shadow has an importance as well,” Jacobs said, speaking about the symbolism of casting Flowers’ poems in light and shadow. Arranged on the wall next to the covered windows are 25 magnolia leaves, the words of Flowers’ poem “Five Remaining Days” burnt through them. The long-dead leaves wired to the wall look like they are falling, getting closer to the ground as the poem counts down Flowers’ remaining days of life. “In these five remaining days I see/ I’ve spent my life bellowing like a mule,” the poem begins. Flowers counts down her four remaining days, her three days, her second to last day and her final day of living, as the scent of the live flowers placed by the door wafts through the gallery. Though apparently unrelated, Graham chose the installation piece “for the breath of a poem” made by Jacobs, a Porter alumna because it exercises poetry by writing it on the wall, much like Sesnon’s calligraphic renditions of poems she copied in her salon book.